Following the previous work on the site, we were commissioned by Carroll Ltd to carry out the watching brief during the demolition of the existing buildings and the construction of the new specialist nursing home. The demolition revealed remains of a ward originally opened in 1916, whilst the watching brief recorded a number of features which appear to relate to the eighteenth and nineteenth century use of the site. These include an enigmatic feature consisting of an ‘L’ shaped, stone walled trench containing masses of nineteenth century ceramics. Of greater importance, however, is the work in the field behind the old hospital complex. Here a “strip, map and sample” program located remains of a post-medieval field boundary. 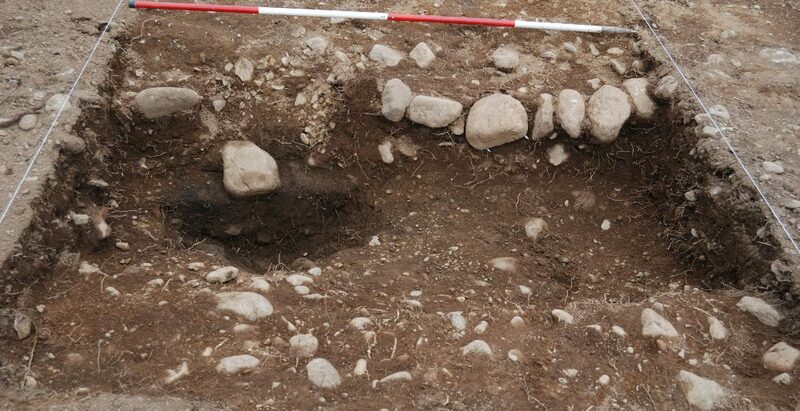 Whilst excavating a section through this feature a small pit was found containing a shard of Late Neolithic or Bronze Age pottery and several flint flakes. This might relate to the Bronze Age “incense cup” and other funerary vessels which are reported as having been found in the area in mid nineteenth century.